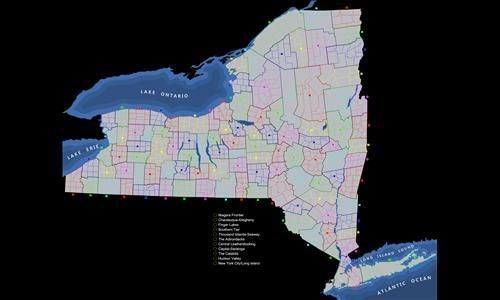 A large map of New York state. Territories are cities/towns, bonuses are counties (or parts thereof). Review by Kellhus on 3/19/2012. Love this map. Very large and complex. Multiple ways to approach it. Bonuses appropriately reflect the difficulty in taking and holding an area. The finger lakes add choke points that influence attack angles. Also, love the attention to detail in the shading of the water! Review by Andy Simmons on 2/23/2013. Very accurate map of New York State. Fun to play with many opponents. Review by Nathan on 11/20/2013. Excellent use of lakes and rivers to create chokepoints. The large bonuses help the game move along more quickly than most on a map this size. For epic battles, I recommend a 3-player FFA with starting points in Champlain, Buffalo and the Hamptons. Review by BloodBath185 on 5/28/2013. 58 turns! Big map can present some difficulties, but a great challenge. Review by mjt172 on 12/8/2013. Review by Aaron on 2/28/2013. LOVED IT!!! but be A.S.A.P (as strategic as possible) when choosing your territories or you will be blocked in! Review by deempire on 9/25/2013. Review by Zillionatom on 6/10/2012. Very good.. specially for teams. it is big, so a little patient is needed. Review by Dogjaw on 10/13/2013. Takes a lot of time to play. Good map though. Review by [REGL] Firehawk on 11/13/2013. Nice map. This map would be great for large team games or FFAs. Review by Tim (TIM CLAN) 😡 on 8/2/2013. Review by -=OWL=- Bin Firnass on 3/23/2014. good map, all about exponential expansion. tho rivers add a bit of a twist. Review by kevin on 7/13/2013. Right size, even bonuses, some nice river/lake funnels. Review by INSIDE on 8/5/2014. Review by Naigel on 11/23/2014. Review by Oprah on 1/23/2015. Review by thesperanation on 5/25/2015. Review by Petyyy on 1/12/2017. Review by A_B3 on 12/12/2017. A larger map making for a longer game, but well balanced and worth playing. Review by Arachnocat14 on 3/18/2018. This seems like a good strategic map, but to be quite honest, it is not all that interesting. Review by eedson on 12/15/2015. Review by KingPatric on 3/13/2014. Review by Comedian on 2/16/2013. Review by GooDMAN on 3/26/2013. Review by MacArthurSheldon on 3/26/2012. Review by The Gingernator on 3/27/2012. 2 out of 19 people found this review helpful.